It is just shy of 1am. I haven’t stayed up this late in longer than I can remember. 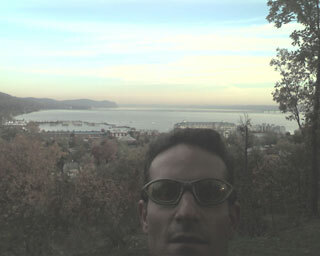 The day started early enough, around 6am with a run through Tallman State Park. I didn’t want to be pissed off at myself for not doing another morning run, so I got out the door of my hotel and had a thoroughly enjoyable run. I stopped on several occasions to take pictures of sights that I thought interesting, including this corny picture of myself taken while holding my camera phone at arms length. After my run, it was a quick breakfast, shower and change of clothes for another morning spent in an all day conference. Today though, I had an important engagement in the afternoon, so I snuck out of it at the lunch time break. I had to be home to change into my Halloween costume and pick up my children from school. It is an annual tradition that I will not miss. I figure I only have a few years in which my kids will want me to pick them up in school dressed in some creepy costume and I am not going to miss one opportunity. 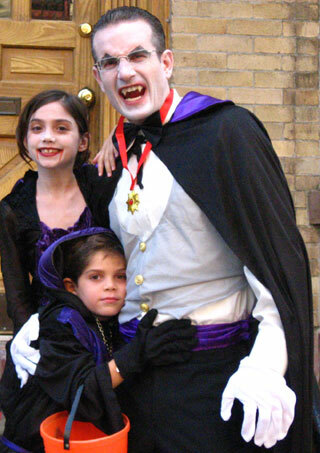 I went as Dracula this year and my son and daughter were matching vampires. I think we looked fantastic if I do say so myself. We went trick or treating throughout our neighborhood and my kids got bucket loads of candy. Hopefully their teeth won’t rot out before they reach their teenage years. After Trick or Treating, we went back home along with another couple and their children. We have been Trick or Treating together for several years now. We ate dinner and the kids then played together and handed out candy to passing trick or treat’ers. My friend knew I had to be back at my conference this evening, for a Halloween party that my company was throwing. It was regrettable that I had to leave my children, but I was exceedingly happy that I was able to get out at all and spend most of Halloween with my children. I got back to the conference early enough so that I missed very little of the Halloween party. It was ok as far as a “work” party goes and I stayed up later than I would have liked and drank more that I should have. I think I am writing with a fairly decent clarity, so it doesn’t appear as though I drank too much. Well now it is past 1am and I am going to go to sleep. I am willing to bet my last dollar that I will not be getting up in the morning for a run. I can’t imagine how that would be possible. Miracles do happen though and perhaps I will be feeling exceedingly masochistic. I do enjoy my pain.